In anticipation for their first cinematic collaboration, actress Isabelle Huppert urged Claire Denis to revisit the same debut novel by Nobel Prize winning author Doris Lessing that had inspired the filmmaker’s directorial debut two decades earlier wherein Denis blended her own recollections of growing up in Africa with the pages of Lessing's The Grass is Singing to create 1988's Chocolat . But given the instability of many African countries and the unmistakable message being sent on the evening news to the rest of the world that revealed the violent determination individuals had in rejecting the colonialism of the past to create an unknown future, Denis knew that a straightforward period film adaptation would be a mistake. Nonetheless, she didn't abandon Lessing's Grass completely since as Huppert intuited, her connection to the work was as strong as it had been back when she spent four years trying to raise enough money to make Chocolat while simultaneously learning the tricks of her eventual trade assisting fellow directors Wim Wenders and Jim Jarmusch . Known as a filmmaker driven by her passion for examining the dueling cultures, existential and humanistic questions of identity and the contemporary double standards involving race, gender, sexuality and class in her dual homelands of France and Africa, Denis was struck by the compelling urgency of the contemporary narrative unfolding right before her eyes. Using the horrific footage she witnessed night after night of French plantation owners being airlifted off their land in the Ivory Coast and the memory of the assassination of Che-like idealistic political leader Thomas Sankara during the production of Chocolat as a starting point, Claire Denis fused fact and fiction together once again to construct what would eventually become White Material alongside award-winning novelist Marie NDiaye. Yet despite the literary background of Material in the form of Lessing's source material and her collaboration with NDiaye, Denis vowed to stay true to the images and feelings that were evoked in the creative process in a decision that had as much to do with the stylistic success of White Material as it did with its structural failure. Though it's an overall unflinchingly powerful and undeniably hypnotic motion picture, by adding one experimental technique on top of another including relying far more on the cinematographic language of the camera to tell the story through stark visuals as opposed to doing so with the convention of dialogue, Denis needlessly complicates matters. Using a nonlinear approach is ambitious enough but when it's sloppily edited and missing a solid “anchor” with which the audience can piece together context clues, the pretentious sense of artistry distracts from the cohesive effectiveness of the work as “art” since Material is so emotionally frustrating and nonsensically narratively challenging that it's riddled with ambiguities on even the most basic level. With one character referred to as a husband in one review, an ex-husband in another and another described as the child of no less than three different individuals in various essays and articles, it's no wonder that details were lost in the translation. Tragically even the performances were overwhelmed by Material's approach, which is a particular shame for Isabelle Huppert as her subtle, nuanced portrayal of a woman undone by hubris and extreme tunnel vision that places her own irrational sense of pride over the personal safety of herself and her loved ones, stands up among Huppert's finest work. 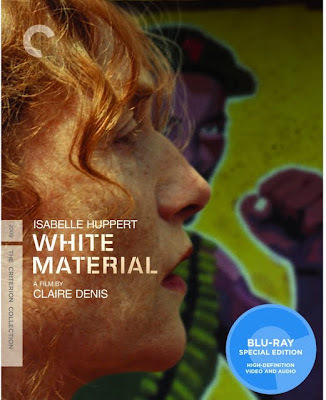 Unwilling to follow in the footsteps of the French military and leave her family's coffee plantation that she runs in the unnamed West African country or acknowledge the true extent of the escalating civil war violence taking place just outside her gates in her adopted homeland, Huppert's Madame Vial is a woman driven past the realm of reason. Huppert, of course is no stranger to depicting varying shades of insanity throughout her varied career as witnessed in multiple Haneke and Chabrol pictures among others. However, in Huppet's unique White portrayal, she imbues her role with an unexpected amount of delicate femininity that's emphasized by the wide static shots from cinematographer Yves Cape (filling in for Denis's longtime DP Agnes Godard) as if she were a China Doll in a Glass Menagerie . The fragility in the wide shots is sharply contrasted by the flipside of her character – once again interpreted through the language of cinema rather than dialogue – that finds the doll trapped in tight, close-ups with Cape's constantly moving camera before she breaks through the glass ceiling altogether like a lioness protecting her cub... even if she seems less attached to her son than her land. Gorgeously restored to a brilliant Blu-ray sheen for its Criterion Collection debut, as an experimental exercise in how much substance can be derived from style, White Material is as fascinating as it is infuriating. Since it's hard to feel connected to characters when you're thoroughly confused, in retrospect I only wish that Denis had stayed truer to literary foundation of Lessing's Grass and/or better utilized the talent of her novelist co-writer. Nonetheless, when it comes to navigating the psychological, cultural, ethical and geographical terrain of feeling simultaneously connected and disconnected to the countries of France and Africa, there's still no greater cinematic guide for the Material in question than Claire Denis.